This article is about the rocket manufacturer. For the British art gallery, see Spacex (art gallery). "Space exploration technologies" redirects here. For other uses, see Outline of space technology. SpaceX announced in 2011 that it was beginning a reusable launch system technology development program. In December 2015, the first Falcon 9 was flown back to a landing pad near the launch site, where it successfully accomplished a propulsive vertical landing. This was the first such achievement by a rocket for orbital spaceflight. In April 2016, with the launch of CRS-8, SpaceX successfully vertically landed the first stage on an ocean drone ship landing platform. In May 2016, in another first, SpaceX again landed the first stage, but during a significantly more energetic geostationary transfer orbit mission. In March 2017, SpaceX became the first to successfully re-launch and land the first stage of an orbital rocket. In September 2016, CEO Elon Musk unveiled the mission architecture of the Interplanetary Transport System program, an ambitious privately funded initiative to develop spaceflight technology for use in crewed interplanetary spaceflight. In 2017, Musk unveiled an updated configuration of the system, now named Starship and Super Heavy, which is planned to be fully reusable and will be the largest rocket ever on its debut, currently scheduled for the early 2020s. In 2001, Elon Musk conceptualized Mars Oasis, a project to land a miniature experimental greenhouse and grow plants on Mars. "This would be the furthest that life’s ever traveled" in an attempt to regain public interest in space exploration and increase the budget of NASA. Musk tried to buy cheap rockets from Russia but returned empty-handed after failing to find rockets for an affordable price. On the flight home, Musk realized that he could start a company that could build the affordable rockets he needed. According to early Tesla and SpaceX investor Steve Jurvetson, Musk calculated that the raw materials for building a rocket actually were only three percent of the sales price of a rocket at the time. By applying vertical integration, producing around 85% of launch hardware in-house, and the modular approach from software engineering, SpaceX could cut launch price by a factor of ten and still enjoy a 70% gross margin. In early 2002, Musk was seeking staff for his new space company, soon to be named SpaceX. Musk approached rocket engineer Tom Mueller (later SpaceX's CTO of Propulsion) and Mueller agreed to work for Musk, and thus SpaceX was born. 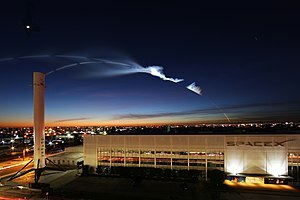 SpaceX was first headquartered in a warehouse in El Segundo, California. The company has grown rapidly since it was founded in 2002, growing from 160 employees in November 2005 to 1,100 in 2010, 3,800 employees and contractors by October 2013, nearly 5,000 by late 2015, and about 6,000 in April 2017. As of November 2017[update], the company had grown to nearly 7,000. In 2016, Musk gave a speech at the International Astronautical Congress, where he explained that the US government regulates rocket technology as an "advanced weapon technology", making it difficult to hire non-Americans. As of March 2018, SpaceX had over 100 launches on its manifest representing about $12 billion in contract revenue. The contracts included both commercial and government (NASA/DOD) customers. In late 2013, space industry media quoted Musk's comments on SpaceX "forcing…increased competitiveness in the launch industry," its major competitors in the commercial comsat launch market being Arianespace, United Launch Alliance, and International Launch Services. At the same time, Musk also said that the increased competition would "be a good thing for the future of space." Currently, SpaceX is the leading global commercial launch provider measured by manifested launches. Musk has stated that one of his goals is to decrease the cost and improve the reliability of access to space, ultimately by a factor of ten. CEO Elon Musk said: "I believe $500 per pound ($1,100/kg) or less is very achievable." A major goal of SpaceX has been to develop a rapidly reusable launch system. As of March 2013[update], the publicly announced aspects of this technology development effort include an active test campaign of the low-altitude, low-speed Grasshopper vertical takeoff, vertical landing (VTVL) technology demonstrator rocket, and a high-altitude, high-speed Falcon 9 post-mission booster return test campaign. In 2015, SpaceX successfully landed the first orbital rocket stage on December 21. To date, SpaceX has successfully landed 25 boosters: 23 Falcon 9 and 5 Falcon Heavy. In 2017, SpaceX formed a subsidiary, The Boring Company, and began work to construct a short underground test tunnel on and adjacent to the SpaceX headquarters and manufacturing facility, utilizing a small number of SpaceX employees, which was completed in May 2018, and opened to the public in December 2018. During 2018, The Boring Company was spun out into a separate corporate entity with 6% of the equity going to SpaceX, less than 10% to early employees, and the remainder of the equity to Elon Musk. At the 2017 International Astronautical Congress in Adelaide, Australia, Musk announced his plans to build large spaceships to reach Mars. Using the BFR, Musk plans to land at least two uncrewed cargo ships to Mars in 2022. The first missions will be used to seek out sources of water and build a propellant plant. In 2024, Musk plans to fly four additional ships to Mars including the first people. From there, additional missions would work to establish a Mars colony. Musk's advocacy for the long-term settlement of Mars, goes far beyond what SpaceX projects to build; a successful colonization would ultimately involve many more economic actors—whether individuals, companies, or governments—to facilitate the growth of the human presence on Mars over many decades. In March 2013, a Dragon spacecraft in orbit developed issues with its thrusters that limited its control capabilities. SpaceX engineers were able to remotely clear the blockages within a short period, and the spacecraft was able to successfully complete its mission to and from the International Space Station. In June 2015, CRS-7 launched a Dragon capsule atop a Falcon 9 to resupply the International Space Station. All telemetry readings were nominal until 2 minutes and 19 seconds into the flight, when a loss of helium pressure was detected and a cloud of vapor appeared outside the second stage. A few seconds after this, the second stage exploded. The first stage continued to fly for a few seconds before disintegrating due to aerodynamic forces. The capsule was thrown off and survived the explosion, transmitting data until it was destroyed on impact. Later it was revealed that the capsule could have landed intact if it had software to deploy its parachutes in case of a launch mishap. The problem was discovered to be a failed 2-foot-long steel strut purchased from a supplier to hold a helium pressure vessel that broke free due to the force of acceleration. This caused a breach and allowed high-pressure helium to escape into the low-pressure propellant tank, causing the failure. The Dragon software issue was also fixed in addition to an analysis of the entire program in order to ensure proper abort mechanisms are in place for future rockets and their payload. In September 2016, a Falcon 9 exploded during a propellant fill operation for a standard pre-launch static fire test. The payload, the Spacecom Amos-6 communications satellite valued at $200 million, was destroyed. Musk described the event as the "most difficult and complex failure" ever in SpaceX's history; SpaceX reviewed nearly 3,000 channels of telemetry and video data covering a period of 35–55 milliseconds for the postmortem. Musk reported the explosion was caused by the liquid oxygen that is used as propellant turning so cold that it solidified and it ignited with carbon composite helium vessels. Though not considered an unsuccessful flight, the rocket explosion sent the company into a four-month launch hiatus while it worked out what went wrong, and SpaceX returned to flight in January 2017. In August 2008, SpaceX accepted a $20 million investment from Founders Fund. In early 2012, approximately two-thirds of the company were owned by its founder and his 70 million shares were then estimated to be worth $875 million on private markets, which roughly valued SpaceX at $1.3 billion as of February 2012. After the COTS 2+ flight in May 2012, the company private equity valuation nearly doubled to $2.4 billion. In January 2015, SpaceX raised $1 billion in funding from Google and Fidelity, in exchange for 8.333% of the company, establishing the company valuation at approximately $12 billion. Google and Fidelity joined prior investors Draper Fisher Jurvetson, Founders Fund, Valor Equity Partners and Capricorn. In July 2017, the Company raised US$350m at a valuation of US$21 billion. As of May 2012[update], SpaceX had operated on total funding of approximately $1 billion in its first ten years of operation. Of this, private equity provided about $200M, with Musk investing approximately $100M and other investors having put in about $100M (Founders Fund, Draper Fisher Jurvetson, ...). The remainder has come from progress payments on long-term launch contracts and development contracts. By March 2018, SpaceX had contracts for 100 launch missions, and each of those contracts provide down payments at contract signing, plus many are paying progress payments as launch vehicle components are built in advance of mission launch, driven in part by US accounting rules for recognizing long-term revenue. 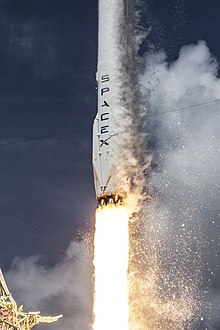 Congressional testimony by SpaceX in 2017 suggested that the NASA Space Act Agreement process of "setting only a high-level requirement for cargo transport to the space station [while] leaving the details to industry" had allowed SpaceX to design and develop the Falcon 9 rocket on its own at substantially lower cost. "According to NASA's own independently verified numbers, SpaceX’s development costs of both the Falcon 1 and Falcon 9 rockets were estimated at approximately US$390 million in total. "In 2011, NASA estimated that it would have cost the agency about US$4 billion to develop a rocket like the Falcon 9 booster based upon NASA's traditional contracting processes". The Falcon 9 launch system, with an estimated improvement at least four to ten times over traditional cost-plus contracting estimates, about $400 million vs. $4 billion in savings through the usage of Space Act Agreements. In April 2019, the Wall Street Journal reported that SpaceX was raising another $500 million in funding. SpaceX currently manufactures three broad classes of rocket engine in-house: the kerosene fueled Merlin engines, the methane fueled Raptor engines, and the hypergolic fueled Draco/SuperDraco vernier thrusters. The Merlin powers their two main space launch vehicles: the Falcon 9, which flew successfully into orbit on its maiden launch in June 2010 and the super-heavy class Falcon Heavy, which was launched for the first time on February 6, 2018. SpaceX also manufactures the Dragon, a pressurized orbital spacecraft that is launched on top of a Falcon 9 booster to carry cargo to low Earth orbit, and the follow-on Dragon 2 spacecraft, or Crew Dragon, currently in the process of being human-rated through a variety of design reviews and flight tests that began in 2014. SpaceX's Falcon 9 rocket carrying the Dragon spacecraft, lifts off during the COTS Demo Flight 1 in December 2010. Since the founding of SpaceX in 2002, the company has developed three families of rocket engines — Merlin and the retired Kestrel for launch vehicle propulsion, and the Draco control thrusters. SpaceX is currently developing two further rocket engines: SuperDraco and Raptor. SpaceX is currently the world’s most prolific producer of liquid fuel rocket engines. Merlin is a family of rocket engines developed by SpaceX for use on its Falcon rocket family. Merlin engines use LOX and RP-1 as propellants in a gas-generator power cycle. The Merlin engine was originally designed for sea recovery and reuse. The injector at the heart of Merlin is of the pintle type that was first used in the Apollo Program for the lunar module landing engine. Propellants are fed via a single shaft, dual impeller turbo-pump. Kestrel is a LOX/RP-1 pressure-fed rocket engine, and was used as the Falcon 1 rocket's second stage main engine. It is built around the same pintle architecture as SpaceX's Merlin engine but does not have a turbo-pump, and is fed only by tank pressure. Its nozzle is ablatively cooled in the chamber and throat, is also radiatively cooled, and is fabricated from a high strength niobium alloy. Both names for the Merlin and Kestrel engines are derived from species of North American falcons: the kestrel and the merlin. Draco are hypergolic liquid-propellant rocket engines that utilize monomethyl hydrazine fuel and nitrogen tetroxide oxidizer. Each Draco thruster generates 400 newtons (90 lbf) of thrust. They are used as reaction control system (RCS) thrusters on the Dragon spacecraft. SuperDraco engines are a much more powerful version of the Draco thrusters, which were initially meant to be used as landing and launch escape system engines on the version 2 Dragon spacecraft, Dragon 2. The concept of using retro-rockets for landing was scrapped in 2017 when it was decided to perform a traditional parachute descent and splashdown at sea. Raptor is a new family of methane-fueled full flow staged combustion cycle engines to be used in its future Interplanetary Transport System. Development versions were test fired in late 2016. On April 3, 2019, SpaceX conducted a successful static fire test in Texas on its Starhopper vehicle, which ignited the engine while the vehicle remained tethered to the ground. Since 2010, SpaceX has flown all its missions on the Falcon 9, with one test flight of Falcon Heavy. They previously developed and flew the Falcon 1 pathfinder vehicle. From left to right, Falcon 1, Falcon 9 v1.0, three versions of Falcon 9 v1.1, three versions of Falcon 9 v1.2 (Full Thrust), three versions of Falcon 9 Block 5, Falcon Heavy and Falcon Heavy Block 5. Falcon 1 was a small rocket capable of placing several hundred kilograms into low earth orbit. It functioned as an early test-bed for developing concepts and components for the larger Falcon 9. Falcon 1 attempted five flights between 2006 and 2009. With Falcon I, when Musk announced his plans for it before a subcommittee in the Senate in 2004, he discussed that Falcon I would be the 'worlds only semi-reusable orbital rocket' apart from the space shuttle. On September 28, 2008, on its fourth attempt, the Falcon 1 successfully reached orbit, becoming the first privately funded, liquid-fueled rocket to do so. Falcon 9 is an EELV-class medium-lift vehicle capable of delivering up to 22,800 kilograms (50,265 lb) to orbit, and is intended to compete with the Delta IV and the Atlas V rockets, as well as other launch providers around the world. It has nine Merlin engines in its first stage. The Falcon 9 v1.0 rocket successfully reached orbit on its first attempt on June 4, 2010. Its third flight, COTS Demo Flight 2, launched on May 22, 2012, and was the first commercial spacecraft to reach and dock with the International Space Station. The vehicle was upgraded to Falcon 9 v1.1 in 2013 and again in 2015 to the current Falcon 9 Full Thrust version. As of February 2018[update], Falcon 9 vehicles have flown 49 successful missions with one failure, the CRS-7 mission. An additional vehicle was destroyed during a routine test several days prior to a scheduled launch in 2016. 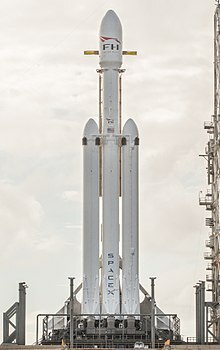 In 2011, SpaceX began development of the Falcon Heavy, a heavy-lift rocket configured using a cluster of three Falcon 9 first stage cores with a total 27 Merlin 1D engines and propellant crossfeed. The Falcon Heavy successfully flew on its inaugural mission on February 6, 2018 with a payload consisting of Musk's personal Tesla Roadster into heliocentric orbit The first stage would be capable of lifting 63,800 kilograms (140,660 lb) to LEO with the 27 Merlin 1D engines producing 22,819 kN of thrust at sea level, and 24,681 kN in space. At the time of its first launch, SpaceX described their Falcon Heavy as "the world's most powerful rocket in operation". In 2005, SpaceX announced plans to pursue a human-rated commercial space program through the end of the decade. The Dragon is a conventional blunt-cone ballistic capsule which is capable of carrying cargo or up to seven astronauts into orbit and beyond. In 2006, NASA announced that the company was one of two selected to provide crew and cargo resupply demonstration contracts to the ISS under the COTS program. SpaceX demonstrated cargo resupply and eventually crew transportation services using the Dragon. The first flight of a Dragon structural test article took place in June 2010, from Launch Complex 40 at Cape Canaveral Air Force Station during the maiden flight of the Falcon 9 launch vehicle; the mock-up Dragon lacked avionics, heat shield, and other key elements normally required of a fully operational spacecraft but contained all the necessary characteristics to validate the flight performance of the launch vehicle. An operational Dragon spacecraft was launched in December 2010 aboard COTS Demo Flight 1, the Falcon 9's second flight, and safely returned to Earth after two orbits, completing all its mission objectives. 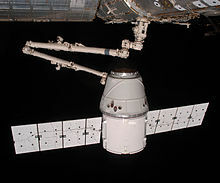 In 2012, Dragon became the first commercial spacecraft to deliver cargo to the International Space Station, and has since been conducting regular resupply services to the ISS. In April 2011, NASA issued a $75 million contract, as part of its second-round commercial crew development (CCDev) program, for SpaceX to develop an integrated launch escape system for Dragon in preparation for human-rating it as a crew transport vehicle to the ISS. In August 2012, NASA awarded SpaceX a firm, fixed-price SAA with the objective of producing a detailed design of the entire crew transportation system. This contract includes numerous key technical and certification milestones, an uncrewed flight test, a crewed flight test, and six operational missions following system certification. The fully autonomous Crew Dragon spacecraft is expected to be one of the safest crewed spacecraft systems. Reusable in nature, the Crew Dragon will offer savings to NASA. SpaceX conducted a test of an empty Crew Dragon to ISS in early 2019, and later in the year they plan to launch a crewed Dragon which will send US astronauts to the ISS for the first time since the retirement of the Space Shuttle. In February 2017 SpaceX announced that two would-be space tourists had put down "significant deposits" for a mission which would see the two tourists fly on board a Dragon capsule around the Moon and back again. In addition to SpaceX's privately funded plans for an eventual Mars mission, NASA Ames Research Center had developed a concept called Red Dragon: a low-cost Mars mission that would use Falcon Heavy as the launch vehicle and trans-Martian injection vehicle, and the Dragon capsule to enter the Martian atmosphere. The concept was originally envisioned for launch in 2018 as a NASA Discovery mission, then alternatively for 2022 The objectives of the mission would be return the samples from Mars to Earth at a fraction of the cost of the NASA own return-sample mission now projected at 6 billion dollars. In September 2017, Elon Musk released first prototype images of their space suits to be used in future missions. The suit is in testing phase and it is designed to cope with 2 ATM pressure in vacuum. The Crew Dragon spacecraft was first sent to space on March 2, 2019. SpaceX is actively pursuing several different research and development programs. Most notable are those intended to develop reusable launch vehicles, an interplanetary transport system and a global telecommunications network. SpaceX has on occasion developed new engineering development technologies to enable it to pursue its various goals. For example, at the 2015 GPU Technology Conference, SpaceX revealed their own computational fluid dynamics (CFD) software to improve the simulation capability of evaluating rocket engine combustion design. Autonomous spaceport drone ship in position prior to Falcon 9 Flight 17 carrying CRS-6. SpaceX's reusable launcher program was publicly announced in 2011 and the design phase was completed in February 2012. The system returns the first stage of a Falcon 9 rocket to a predetermined landing site using only its own propulsion systems. SpaceX's active test program began in late 2012 with testing low-altitude, low-speed aspects of the landing technology. Grasshopper and the Falcon 9 Reusable Development Vehicles (F9R Dev) were experimental technology-demonstrator reusable rockets that performed vertical takeoffs and landings. High-velocity, high-altitude aspects of the booster atmospheric return technology began testing in late 2013 and have continued through 2018, with a 98% success rate to date. As a result of Elon Musk's goal of crafting more cost-effective launch vehicles, SpaceX conceived a method to reuse the first stage of their primary rocket, the Falcon 9, by attempting propulsive vertical landings on solid surfaces. Once the company determined that soft landings were feasible by touching down over the Atlantic and Pacific Ocean, they began landing attempts on a solid platform. SpaceX leased and modified several barges to sit out at sea as a target for the returning first stage, converting them to autonomous spaceport drone ships (ASDS). SpaceX first achieved a successful landing and recovery of a first stage in December 2015, and in April 2016, the first stage booster first successfully landed on the ASDS Of Course I Still Love You. SpaceX continues to carry out first stage landings on every orbital launch that fuel margins allow. By October 2016, following the successful landings, SpaceX indicated they were offering their customers a ten percent price discount if they choose to fly their payload on a reused Falcon 9 first stage. On March 30, 2017, SpaceX launched a "flight-proven" Falcon 9 for the SES-10 mission. This was the first time a re-launch of a payload-carrying orbital rocket went back to space. The first stage was recovered and landed on the ASDS Of Course I Still Love You in the Atlantic Ocean, also making it the first landing of a reused orbital class rocket. Elon Musk called the achievement an "incredible milestone in the history of space." Artist's impression of the Interplanetary Starship on the Jovian moon Europa. SpaceX is developing a super-heavy lift launch system, the BFR. The BFR is a fully reusable first stage launch vehicle and spacecraft intended to replace all of the company's existing hardware by the early 2020s, ground infrastructure for rapid launch and relaunch, and zero-gravity propellant transfer technology in low Earth orbit (LEO). SpaceX initially envisioned the ITS vehicle design which was solely aimed at Mars transit and other interplanetary uses, SpaceX in 2017 began to focus on a vehicle support all SpaceX launch service provider capabilities: Earth-orbit, lunar-orbit, interplanetary missions, and even intercontinental passenger transport on Earth. Private passenger Yusaku Maezawa has been signed to fly around the Moon in the BFR rocket. Musk's long term vision for the company is the development of technology and resources suitable for human colonization on Mars. He has expressed his interest in someday traveling to the planet, stating "I'd like to die on Mars, just not on impact." A rocket every two years or so could provide a base for the people arriving in 2025 after a launch in 2024. According to Steve Jurvetson, Musk believes that by 2035 at the latest, there will be thousands of rockets flying a million people to Mars, in order to enable a self-sustaining human colony. In January 2015, SpaceX CEO Elon Musk announced the development of a new satellite constellation to provide global broadband internet service. In June 2015 the company asked the federal government for permission to begin testing for a project that aims to build a constellation of 4,425 satellites capable of beaming the Internet to the entire globe, including remote regions which currently do not have Internet access. The Internet service would use a constellation of 4,425 cross-linked communications satellites in 1,100 km orbits. Owned and operated by SpaceX, the goal of the business is to increase profitability and cashflow, to allow SpaceX to build its Mars colony. Development began in 2015, initial prototype test-flight satellites were launched on the SpaceX PAZ mission in 2017. Initial operation of the constellation could begin as early as 2020. As of March 2017[update], SpaceX filed with the US regulatory authorities plans to field a constellation of an additional 7,518 "V-band satellites in non-geosynchronous orbits to provide communications services" in an electromagnetic spectrum that had not previously been "heavily employed for commercial communications services". Called the "V-band low-Earth-orbit (VLEO) constellation", it would consist of "7,518 satellites to follow the [earlier] proposed 4,425 satellites that would function in Ka- and Ku-band". In February 2019, SpaceX formed a sibling company, SpaceX Services, Inc., to license the manufacture and deployment of up to 1,000,000 fixed satellite earth stations that will communicate with its Starlink system. In June 2015, SpaceX announced that they would sponsor a Hyperloop competition, and would build a 1-mile-long (1.6 km) subscale test track near SpaceX's headquarters for the competitive events. The first competitive event was held at the track in January 2017 and the second in August 2017. And the third in December 2018. SpaceX is headquartered in Hawthorne, California, which also serves as its primary manufacturing plant. The company owns a test site in Texas and operates three launch sites, with another under development. SpaceX also operates regional offices in Redmond, Texas, Virginia, and Washington, D.C.
SpaceX Headquarters is located in the Los Angeles suburb of Hawthorne, California. The large three-story facility, originally built by Northrop Corporation to build Boeing 747 fuselages, houses SpaceX's office space, mission control, and, as of 2018, all vehicle manufacturing. In March 2018, SpaceX indicated that it would manufacture its next-generation, 9 m (30 ft)-diameter launch vehicle, the BFR at a new facility it is building on the Los Angeles waterfront in the San Pedro area. The company has leased an 18-acre site near Berth 240 in the Los Angeles port for 10 years, with multiple renewals possible, and will use the site for manufacturing, recovery from shipborne landings, and refurbishment of both the BFR booster and the BFR spaceship. The area has one of the largest concentrations of aerospace headquarters, facilities, and/or subsidiaries in the U.S., including Boeing/McDonnell Douglas main satellite building campuses, Aerospace Corp., Raytheon, NASA's Jet Propulsion Laboratory, Air Force Space Command's Space and Missile Systems Center at Los Angeles Air Force Base, Lockheed Martin, BAE Systems, Northrop Grumman, and AECOM, etc., with a large pool of aerospace engineers and recent college engineering graduates. SpaceX utilizes a high degree of vertical integration in the production of its rockets and rocket engines. SpaceX builds its rocket engines, rocket stages, spacecraft, principal avionics and all software in-house in their Hawthorne facility, which is unusual for the aerospace industry. Nevertheless, SpaceX still has over 3,000 suppliers with some 1,100 of those delivering to SpaceX nearly weekly. SpaceX operates their first Rocket Development and Test Facility in McGregor, Texas. All SpaceX rocket engines are tested on rocket test stands, and low-altitude VTVL flight testing of the Falcon 9 Grasshopper v1.0 and F9R Dev1 test vehicles in 2013–2014 were carried out at McGregor. 2019 low-altitude VTVL testing of the much larger 9-meter (30 ft)-diameter "Starhopper" is planned to occur at the SpaceX South Texas Launch Site near Brownsville, Texas, which is currently under construction. On January 23, 2019, strong winds at the Texas test launch site blew over the nose cone over the first test article rocket, causing delays that will take weeks to repair according to SpaceX representatives. In the event, SpaceX decided to forego building another nose cone for the first test article, because at the low velocities planned for that rocket, it was unnecessary. In addition to routine testing, Dragon capsules (following recovery after an orbital mission), are shipped to McGregor for de-fueling, cleanup, and refurbishment for reuse in future missions. SpaceX currently operates three orbital launch sites, at Cape Canaveral, Vandenberg Air Force Base, and Kennedy Space Center, and is under construction on a fourth in Brownsville, Texas. SpaceX has indicated that they see a niche for each of the four orbital facilities and that they have sufficient launch business to fill each pad. The Vandenberg launch site enables highly inclined orbits (66–145°), while Cape Canaveral enables orbits of medium inclination, up to 51.6°. Before it was retired, all Falcon 1 launches took place at the Ronald Reagan Ballistic Missile Defense Test Site on Omelek Island. Cape Canaveral Air Force Station Space Launch Complex 40 (SLC-40) is used for Falcon 9 launches to low Earth and geostationary orbits. SLC-40 is not capable of supporting Falcon Heavy launches. As part of SpaceX's booster reusability program, the former Launch Complex 13 at Cape Canaveral, now renamed Landing Zone 1, has been designated for use for Falcon 9 first-stage booster landings. On April 14, 2014, SpaceX signed a 20-year lease for Launch Pad 39A. The pad was subsequently modified to support Falcon 9 and Falcon Heavy launches. SpaceX has launched 13 Falcon 9 missions from Launch Pad 39A and more recently the Falcon Heavy Rocket, on April 11, 2019. SpaceX intends to launch the first crewed missions to the ISS from Launch Pad 39A in 2019. In August 2014, SpaceX announced they would be building a commercial-only launch facility at Brownsville, Texas. The Federal Aviation Administration released a draft Environmental Impact Statement for the proposed Texas facility in April 2013, and "found that 'no impacts would occur' that would force the Federal Aviation Administration to deny SpaceX a permit for rocket operations," and issued the permit in July 2014. SpaceX started construction on the new launch facility in 2014 with production ramping up in the latter half of 2015, with the first suborbital launches from the facility in 2019. Real estate packages at the location have been named by SpaceX with names based on the theme "Mars Crossing". In January 2015, SpaceX announced it would be entering the satellite production business and global satellite internet business. The first satellite facility is a 30,000 square foot (2800m2) office building located in Redmond, Washington. As of January 2017, a second facility in Redmond was acquired with 40,625 square feet (3800m2) and has become a research and development lab for the satellites. In July 2016, SpaceX acquired an additional 740 square meters (8,000 sq ft) creative space in Irvine, California (Orange County) to focus on satellite communications. SpaceX won demonstration and actual supply contracts from NASA for the International Space Station (ISS) with technology the company developed. SpaceX is also certified for US military launches of Evolved Expendable Launch Vehicle-class (EELV) payloads. With approximately 30 missions on manifest for 2018 alone, SpaceX represents over $12B under contract. In 2006, NASA announced that SpaceX had won a NASA Commercial Orbital Transportation Services (COTS) Phase 1 contract to demonstrate cargo delivery to the ISS, with a possible contract option for crew transport. This contract, designed by NASA to provide "seed money" through Space Act Agreements for developing new capabilities, NASA paid SpaceX $396 million to develop the cargo configuration of the Dragon spacecraft, while SpaceX self-invested more than $500 million to develop the Falcon 9 launch vehicle. These Space Act Agreements have been shown to have saved NASA millions of dollars in development costs, making rocket development ~4-10 times cheaper than if produced by NASA alone. In December 2010, the launch of the COTS Demo Flight 1 mission, SpaceX became the first private company to successfully launch, orbit and recover a spacecraft. Dragon was successfully deployed into orbit, circled the Earth twice, and then made a controlled re-entry burn for a splashdown in the Pacific Ocean. With Dragon's safe recovery, SpaceX became the first private company to launch, orbit, and recover a spacecraft; prior to this mission, only government agencies had been able to recover orbital spacecraft. COTS Demo Flight 2 launched in May 2012, in which Dragon successfully berthed with the ISS, marking the first time that a private spacecraft had accomplished this feat. Commercial Resupply Services (CRS) are a series of contracts awarded by NASA from 2008–2016 for delivery of cargo and supplies to the ISS on commercially operated spacecraft. The first CRS contracts were signed in 2008 and awarded $1.6 billion to SpaceX for 12 cargo transport missions, covering deliveries to 2016. SpaceX CRS-1, the first of the 12 planned resupply missions, launched in October 2012, achieved orbit, berthed and remained on station for 20 days, before re-entering the atmosphere and splashing down in the Pacific Ocean. CRS missions have flown approximately twice a year to the ISS since then. In 2015, NASA extended the Phase 1 contracts by ordering an additional three resupply flights from SpaceX. After further extensions late in 2015, SpaceX is currently scheduled to fly a total of 20 missions. A second phase of contracts (known as CRS2) were solicited and proposed in 2014. They were awarded in January 2016, for cargo transport flights beginning in 2019 and expected to last through 2024. The Commercial Crew Development (CCDev) program intends to develop commercially operated spacecraft that are capable of delivering astronauts to the ISS. SpaceX did not win a Space Act Agreement in the first round (CCDev 1), but during the second round (CCDev 2), NASA awarded SpaceX with a contract worth $75 million to further develop their launch escape system, test a crew accommodations mock-up, and to further progress their Falcon/Dragon crew transportation design. The CCDev program later became Commercial Crew Integrated Capability (CCiCap), and in August 2012, NASA announced that SpaceX had been awarded $440 million to continue development and testing of its Dragon 2 spacecraft. In September 2014, NASA chose SpaceX and Boeing as the two companies that will be funded to develop systems to transport U.S. crews to and from the ISS. SpaceX won $2.6 billion to complete and certify Dragon 2 by 2017. The contracts include at least one crewed flight test with at least one NASA astronaut aboard. Once Crew Dragon achieves NASA certification, the contract requires SpaceX to conduct at least two, and as many as six, crewed missions to the space station. In early 2017, SpaceX was awarded four additional crewed missions to the ISS from NASA to shuttle astronauts back and forth. In early 2019, SpaceX successfully conducted a test flight of Crew Dragon, which it docked (instead of Dragon 1's method of berthing using Canadarm 2) and then splashed down in the Atlantic ocean. 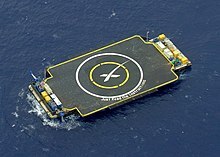 In 2005, SpaceX announced that it had been awarded an Indefinite Delivery/Indefinite Quantity (IDIQ) contract for Responsive Small Spacelift (RSS) launch services by the United States Air Force, which could allow the Air Force to purchase up to $100 million worth of launches from the company. In April 2008, NASA announced that it had awarded an IDIQ Launch Services contract to SpaceX for up to $1 billion, depending on the number of missions awarded. The contract covers launch services ordered by June 2010, for launches through December 2012. Musk stated in the same 2008 announcement that SpaceX has sold 14 contracts for flights on the various Falcon vehicles. In December 2012, SpaceX announced its first two launch contracts with the United States Department of Defense. The United States Air Force Space and Missile Systems Center awarded SpaceX two EELV-class missions: Deep Space Climate Observatory (DSCOVR) and Space Test Program 2 (STP-2). DSCOVR was launched on a Falcon 9 launch vehicle in 2015, while STP-2 will be launched on a Falcon Heavy in 2019. In May 2015, the United States Air Force announced that the Falcon 9 v1.1 was certified for launching "national security space missions," which allows SpaceX to contract launch services to the Air Force for any payloads classified under national security. This broke the monopoly held since 2006 by ULA over the US Air Force launches of classified payloads. In April 2016, the U.S. Air Force awarded the first such national security launch, an $82.7 million contract to SpaceX to launch the 2nd GPS III satellite in May 2018; this estimated cost was approximately 40% less than the estimated cost for similar previous missions. Prior to this, United Launch Alliance was the only provider certified to launch national security payloads. ULA did not submit a bid for the May 2018 launch. In 2016 the US National Reconnaissance Office said it had purchased launches from SpaceX - the first (for NROL-76) took place on 1 May 2017. In March 2017 SpaceX won (vs ULA) with a bid of $96.5 million for the 3rd GPS III launch (due Feb 2019). In March 2018, SpaceX secured an additional $290 million contract from the U.S. Air Force to launch three next generation GPS satellites, known as GPS III. The first of these launches is expected to take place in March 2020. In February 2019, SpaceX secured a $297 million contract from the US. Air Force to launch three national security missions, including AFSPC-44, NROL-87, and NROL-85, all slated to launch NET FY 2021. SpaceX won a contract to launch two Kazakhstan's satellites aboard the Falcon 9 launch rocket on a rideshare with other satellites. The takeoff was scheduled for November 19, 2018. According to the Kazakh Defence and Aerospace Ministry, the launch from SpaceX would cost the country $1.3 million. The two small satellites are named KazSaySat and KazistiSat. SpaceX's low launch prices, especially for communication satellites flying to geostationary (GTO) orbit, have resulted in market pressure on its competitors to lower their own prices. Prior to 2013, the openly competed comsat launch market had been dominated by Arianespace (flying Ariane 5) and International Launch Services (flying Proton). With a published price of US$56.5 million per launch to low Earth orbit, "Falcon 9 rockets [were] already the cheapest in the industry. Reusable Falcon 9s could drop the price by an order of magnitude, sparking more space-based enterprise, which in turn would drop the cost of access to space still further through economies of scale." SpaceX has publicly indicated that if they are successful with developing the reusable technology, launch prices in the US$5 to 7 million range for the reusable Falcon 9 are possible. In 2014, SpaceX had won nine contracts out of 20 that were openly competed worldwide in 2014 at commercial launch service providers. Space media reported that SpaceX had "already begun to take market share" from Arianespace. Arianespace has requested that European governments provide additional subsidies to face the competition from SpaceX. European satellite operators are pushing the ESA to reduce Ariane 5 and the future Ariane 6 rocket launch prices as a result of competition from SpaceX. According to one Arianespace managing director in 2015, it was clear that "a very significant challenge [was] coming from SpaceX ... Therefore things have to change ... and the whole European industry is being restructured, consolidated, rationalised and streamlined." Jean Botti, Director of innovation for Airbus (which makes the Ariane 5) warned that "those who don't take Elon Musk seriously will have a lot to worry about." In 2014, no commercial launches were booked to fly on the Russian Proton rocket. Also in 2014, SpaceX capabilities and pricing began to affect the market for launch of US military payloads. For nearly a decade the large US launch provider United Launch Alliance (ULA) had faced no competition for military launches. Without this competition, launch costs by the U.S. provider rose to over $400 million. The ULA monopoly ended when SpaceX began to compete for national security launches. At a side-by-side comparison, SpaceX’s launch costs for commercial missions are considerably lower at $62 million. In 2015, anticipating a slump in domestic military and spy launches, ULA stated that it would go out of business unless it won commercial satellite launch orders. To that end, ULA announced a major restructuring of processes and workforce in order to decrease launch costs by half. In 2017, SpaceX had 45% global market share for awarded commercial launch contracts, the estimate for 2018 is about 65% as of July 2018. On January 11, 2019, SpaceX issued a statement announcing it will lay off 10% of its workforce, in order to help finance the Starship and Starlink projects. ^ "California Business Search (C2414622 - Space Exploration Technologies Corp)". California Secretary of State. Retrieved May 5, 2018. ^ Fred Lambert (November 17, 2016). "Elon Musk's stake in SpaceX is actually worth more than his Tesla shares". Retrieved March 1, 2017. ^ a b Foust, Jeff (November 16, 2017). "Shotwell: I was the 7th employee at SpaceX. We're up to about 7,000 now. #NewSpaceEurope". Retrieved January 13, 2019. ^ a b AGENDA ITEM NO. 9, CITY OF HAWTHORNE CITY COUNCIL, AGENDA BILL, 11 September 2018, Planning & Community Development Department, City of Hawthorne, accessed 13 September 2018. ^ "Gwynne Shotwell: Executive Profile & Biography". Bloomberg. Retrieved March 1, 2017. ^ W.J. Hennigan (June 7, 2013). "How I Made It: SpaceX exec Gwynne Shotwell". Los Angeles Times. Retrieved March 1, 2017. ^ SpaceX Tour – Texas Test Site. spacexchannel. November 11, 2010. Retrieved May 23, 2012. ^ "SpaceX NASA CRS-6 PressKit Site" (PDF). April 12, 2015. Retrieved April 13, 2015. ^ Kenneth Chang (September 27, 2016). "Elon Musk's Plan: Get Humans to Mars, and Beyond". New York Times. Retrieved September 27, 2016. ^ a b "Making Life Multi-planetary - RELAYTO/". RELAYTO/. 2018. Retrieved April 4, 2018. ^ Shontell, Alyson. "Elon Musk Decided To Put Life On Mars Because NASA Wasn't Serious Enough". Business Insider. Retrieved February 2, 2019. ^ Stephen Clark (September 28, 2008). "Sweet Success at Last for Falcon 1 Rocket". Spaceflight Now. Retrieved March 1, 2017. ^ Kenneth Chang (May 25, 2012). "Space X Capsule Docks at Space Station". New York Times. Retrieved May 25, 2012. ^ William Graham (April 13, 2015). "SpaceX Falcon 9 launches CRS-6 Dragon en route to ISS". NASASpaceFlight. Retrieved May 15, 2015. ^ Kirstin Brost (April 19, 2011). "SpaceX Wins NASA Contract to Complete Development of Successor to the Space Shuttle". SpaceX. Retrieved December 8, 2015. ^ "SpaceXNow, Upcoming Missions". Spacexnow.com. Retrieved October 22, 2018. ^ "SpaceX Crew Dragon completes first unmanned flight test". www.indiatvnews.com. March 9, 2019. Retrieved March 11, 2019. ^ Matthew Weaver (December 22, 2015). "'Welcome back, baby': Elon Musk celebrates SpaceX rocket launch – and landing". the Guardian. Retrieved March 1, 2017. ^ "SpaceX rocket successfully lands on ocean drone platform for third time". The Guardian. April 8, 2016. Retrieved March 1, 2017. ^ Loren Grush (May 19, 2016). "SpaceX successfully lands its Falcon 9 rocket on a floating drone ship again". The Verge. Retrieved March 1, 2017. ^ Amos, Jonathan. "Success for SpaceX 're-usable rocket'". BBC. BBC. Retrieved March 30, 2017. ^ "Mars Presentation | 2016". RELAYTO/. 2018. ^ September 18, CBS News; 2018; Am, 8:15. "Elon Musk says moon mission is "dangerous" but SpaceX's first passenger isn't scared". www.cbsnews.com. Retrieved February 2, 2019. ^ Miles O'Brien (June 1, 2012). "Elon Musk Unedited". Archived from the original on March 23, 2017. Retrieved March 1, 2017. ^ John Carter McKnight (September 25, 2001). "Elon Musk, Life to Mars Foundation". Space Frontier Foundation. Retrieved March 1, 2017. ^ Elon Musk (May 30, 2009). "Risky Business". IEEE Spectrum. Retrieved March 1, 2017. ^ Elon Musk on dodging a nervous breakdown. YouTube. April 20, 2015. Retrieved March 1, 2017. ^ a b c d Andrew Chaikin (January 2012). "Is SpaceX Changing the Rocket Equation?". Air & Space Smithsonian. Retrieved March 1, 2017. ^ a b Ashlee Vance (May 14, 2015). "Elon Musk's space dream almost killed Tesla". Bloomberg. Retrieved March 1, 2017. ^ "How Steve Jurvetson Saved Elon Musk". Business Insider. September 14, 2012. Retrieved June 4, 2015. ^ "SpaceX". NASA Space Academy at Glenn. Retrieved June 4, 2015. ^ Elon's SpaceX Tour – Engines. YouTube. December 11, 2010. Retrieved March 1, 2017. ^ SpaceX and Daring to Think Big – Steve Jurvetson. YouTube. January 28, 2015. Retrieved June 4, 2015. ^ Michael Belfiore (September 1, 2009). "Behind the Scenes With the World's Most Ambitious Rocket Makers". Popular Mechanics. Retrieved March 1, 2017. ^ Foust, Jeff (November 14, 2005). "Big plans for SpaceX". The Space Review. ^ "Diane Murphy joins SpaceX as Vice President of Marketing and Communications" (Press release). SpaceX. July 10, 2008. Archived from the original on July 13, 2010. ^ Messier, Doug (October 16, 2013). "ISPCS Morning Session: Gwynne Shotwell of SpaceX". Retrieved December 7, 2015. Gwynne Shotwell says that SpaceX is now up to about 3,800 employees, counting contractors working for the company. ... 600 more people to hire in next couple months. Finding good software people the hardest skills to fill. ^ "SpaceX's Redmond effort 'very speculative'". Seattle Times. November 7, 2015. Retrieved March 1, 2017. ^ Gwynne Shotwell (February 3, 2016). Gwynne Shotwell comments at Commercial Space Transportation Conference. Commercial Spaceflight. Event occurs at 2:43:15–3:10:05. Retrieved February 4, 2016. ^ de Selding, Peter B. (April 14, 2017). "Blue Origin's older than SpaceX in more ways than one". Space Intel Report. Retrieved April 15, 2017. ^ Crosbie, Jackie (September 28, 2016). "Elon Musk Explains Why SpaceX Only Hires Americans". ^ spacexcmsadmin (November 27, 2012). "Company". SpaceX. Retrieved March 29, 2018. ^ a b c d "Company | SpaceX". SpaceX. Retrieved March 1, 2017. ^ Stephen Clark (November 24, 2013). "Sizing up America's place in the global launch industry". Spaceflight Now. Archived from the original on December 3, 2013. Retrieved November 25, 2013. ^ Hughes, Tim (July 13, 2017). "STATEMENT OF TIM HUGHES SENIOR VICE PRESIDENT FOR GLOBAL BUSINESS & GOVERNMENT AFFAIRS SPACE EXPLORATION TECHNOLOGIES CORP. (SPACEX)" (PDF). ^ "Space Exploration Technologies Corporation – press". SpaceX. Retrieved December 15, 2012. ^ a b Doug Mohney (September 26, 2011). "SpaceX Plans to Test Reusable Suborbital VTVL Rocket in Texas". Satellite Spotlight. Retrieved March 1, 2017. ^ a b "Reusable rocket prototype almost ready for first liftoff". Spaceflight Now. July 9, 2012. Retrieved March 1, 2017. ^ Irene Klotz (September 27, 2011). "A rocket that lifts off — and lands — on launch pad". MSNBC. Retrieved March 1, 2017. ^ Nelson, Laura J. (November 21, 2017). "Elon Musk's tunneling company wants to dig through L.A." latimes.com. Retrieved September 13, 2018. ^ Elon Musk posted video of his Boring Company tunnels under LA, saying people can use them 'in a few months' for free Business Insider, 11 May 2018, accessed 20 May 2018. ^ "Nothing 'Boring' About Elon Musk's Newly Revealed Underground Tunnel". cbslocal.com. May 11, 2018. Retrieved February 2, 2019. ^ "SpaceX has published Elon Musk's presentation about colonizing Mars — here's the full transcript and slides". Business Insider. Retrieved March 29, 2018. ^ "Elon Musk revealed a new plan to colonize Mars with giant reusable spaceships — here are the highlights". Business Insider. Retrieved March 29, 2018. ^ Rory Carroll (July 17, 2013). "Elon Musk's mission to Mars". The Guardian. Retrieved February 5, 2014. ^ Douglas Messier (February 5, 2014). "Elon Musk Talks ISS Flights, Vladimir Putin and Mars". Parabolic Arc. ^ Berger, Eric (September 28, 2016). "Musk's Mars moment: Audacity, madness, brilliance—or maybe all three". Ars Technica. Retrieved October 13, 2016. ^ Foust, Jeff (October 10, 2016). "Can Elon Musk get to Mars?". SpaceNews. Retrieved October 12, 2016. ^ Boyle, Alan (September 27, 2016). "SpaceX's Elon Musk makes the big pitch for his decades-long plan to colonize Mars". GeekWire. Retrieved October 3, 2016. ^ Mir Juned Hussain. "The Rise and Rise of SpaceX". Yaabot. Retrieved March 1, 2017. ^ a b "Elon Musk's SpaceX makes history by launching a 'flight-proven' rocket". Washington Post. Retrieved March 31, 2017. ^ "SpaceX, In Another First, Recovers $6 Million Nose Cone From Reused Falcon 9". Fortune.com. Retrieved May 2, 2017. ^ spacexcmsadmin (January 29, 2016). "ZUMA MISSION". ^ "SpaceX Crew Dragon Hatch Open". NASA Blog. March 3, 2019. Retrieved March 3, 2019. ^ Stephen Clark (July 20, 2015). "Support strut probable cause of Falcon 9 failure". Spaceflight Now. Retrieved March 1, 2017. ^ "CRS-7 Investigation Update". SpaceX. July 20, 2015. Retrieved March 1, 2017. ^ "NASA Independent Review Team [IRT] SpaceX CRS-7 Accident Investigation Report Public Summary" (PDF). NASA. Retrieved March 12, 2018. "....the key technical finding by the IRT with regard to this failure was that it was due to a design error: SpaceX chose to use an industrial grade (as opposed to aerospace grade) 17-4 PH SS (precipitation-hardening stainless steel) cast part (the “Rod End”) in a critical load path under cryogenic conditions and strenuous flight environments. The implementation was done without adequate screening or testing of the industrial grade part, without regard to the manufacturer’s recommendations for a 4:1 factor of safety when using their industrial grade part in an application, and without proper modeling or adequate load testing of the part under predicted flight conditions. This design error is directly related to the Falcon 9 CRS-7 launch failure as a “credible” cause...."
^ Samantha Masunaga and Melody Petersen (September 2, 2016). "SpaceX rocket exploded in an instant. Figuring out why involves a mountain of data". LA Times. Retrieved March 1, 2017. ^ Reem Nasr (July 20, 2015). "Musk: This Is What Caused the SpaceX Launch Failure". CNBC. Retrieved March 1, 2017. ^ "SpaceX on Twitter: Update on this morning's anomaly". Twitter. September 1, 2016. Retrieved March 1, 2017. ^ Calandrelli E, Escher A (December 16, 2016). "The top 15 events that happened in space in 2016". TechCrunch. Retrieved March 1, 2017. ^ Marco Santana (September 6, 2016). "SpaceX customer vows to rebuild satellite in explosion aftermath". Orlando Sentinel. Retrieved March 1, 2017. ^ Samantha Masunaga (September 9, 2016). "Elon Musk: Launch pad explosion is 'most difficult and complex' failure in SpaceX's 14 years". LA Times. Retrieved March 1, 2017. ^ Loren Grush (November 5, 2016). "Elon Musk says SpaceX finally knows what caused the latest rocket failure". The Verge. Retrieved March 1, 2017. ^ "Anomaly Updates". SpaceX. September 1, 2016. Retrieved March 1, 2017. ^ Emily Shanklin (August 4, 2008). "SpaceX receives $20 million investment from Founder's Fund" (Press release). SpaceX. Archived from the original on August 6, 2008. Retrieved March 1, 2017. ^ Caleb Melby (March 12, 2012). "How Elon Musk Became A Billionaire Twice Over". Forbes. Retrieved March 1, 2017. ^ "Elon Musk Anticipates Third IPO in Three Years With SpaceX". Bloomberg. February 11, 2012. Retrieved March 1, 2017. ^ Jane Watts (April 27, 2012). "Elon Musk on Why SpaceX Has the Right Stuff to Win the Space Race". CNBC. Retrieved March 1, 2017. ^ "Privately-held SpaceX Worth Nearly $2.4 Billion or $20/Share, Double Its Pre-Mission Secondary Market Value Following Historic Success at the International Space Station". Privco. June 7, 2012. Retrieved March 1, 2017. ^ Ricardo Bilton (June 10, 2012). "SpaceX's worth skyrockets to $4.8B after successful mission". VentureBeat. Retrieved March 1, 2017. ^ Brian Berger (January 20, 2015). "SpaceX Confirms Google Investment". SpaceNews. Retrieved March 1, 2017. ^ "SpaceX Is Now One of the World's Most Valuable Privately Held Companies". NY Times. July 27, 2017. Retrieved November 16, 2017. ^ "SpaceX overview on secondmarket". SecondMarket. Archived from the original on December 17, 2012. ^ a b Zapata, Edgar. "An Assessment of Cost Improvements in the NASA COTS/CRS Program and Implications for Future NASA Missions" (PDF). ^ Winkler, Rolfe; Pasztor, Andy (April 15, 2019). "SpaceX Is Raising $500 Million Amid Internal Questions Over Satellite Internet Business". Wall Street Journal. ISSN 0099-9660. Retrieved April 15, 2019. ^ "SpaceX's Falcon 9 breaks EELV monopoly". Spaceflight Insider. May 27, 2015. Retrieved July 15, 2015. ^ a b c "Falcon 9 Overview". SpaceX. 2011. Archived from the original on February 10, 2007. Retrieved March 1, 2017. ^ a b "Private space capsule's maiden voyage ends with a splash". BBC News. December 8, 2010. Retrieved March 1, 2017. ^ Miriam Kramer (May 30, 2014). "SpaceX Unveils Dragon V2 Spaceship, a Manned Space Taxi for Astronauts — Meet Dragon V2: SpaceX's Manned Space Taxi for Astronaut Trips". Space.com. Retrieved March 1, 2017. ^ Shotwell, Gwynne (March 17, 2015). "STATEMENT OF GWYNNE SHOTWELL PRESIDENT & CHIEF OPERATING OFFICER SPACE EXPLORATION TECHNOLOGIES CORP. (SPACEX)" (PDF). ^ Wilkins, Alasdair. "Tesla, Falcon 9, Heart of Gold: How Elon Musk Names His Inventions". Inverse. Retrieved February 2, 2019. ^ "SpaceX Draco Thruster Performs Long-Duration Firing and Restart" (Press release). SpaceX. December 9, 2008. Retrieved March 1, 2017. ^ Colangelo, Anthony. "Farewell, Red Dragon". Main Engine Cut Off. Retrieved February 1, 2019. ^ "SpaceX performs first test of Raptor engine". SpaceNews.com. September 26, 2016. Retrieved April 28, 2017. ^ Grush, Loren (April 3, 2019). "SpaceX just fired up the engine on its test Starship vehicle for the first time". The Verge. Retrieved April 4, 2019. ^ "THE SPACE SHUTTLE AND FUTURE SPACE LAUNCH VEHICLES". Senate Hearing 108-1001. May 5, 2004. ^ a b c Canadian Press (May 22, 2012). "Private SpaceX rocket blasts off for space station Cargo ship reaches orbit 9 minutes after launch". CBC News. Retrieved March 1, 2017. ^ "Falcon Heavy Overview". Space. 2011. Archived from the original on December 1, 2011. Retrieved March 1, 2017. ^ Clark Lindsey (January 4, 2013). "NewSpace flights in 2013". NewSpace Watch. Retrieved January 3, 2013. ^ spacexcmsadmin (November 15, 2012). "Falcon Heavy". SpaceX. Retrieved April 5, 2017. ^ Rituparna Chatterjee (April 7, 2011). "Falcon Heavy: World's most powerful rocket". Times of India. Retrieved March 1, 2017. ^ a b Keith Cowing (March 6, 2006). "The SpaceX Dragon: America's First Privately Financed Manned Orbital Spacecraft?". SpaceRef. Retrieved March 1, 2017. ^ "NASA selects crew, cargo launch partners". Spaceflight Now. August 18, 2006. Retrieved March 1, 2017. ^ "COTS Demo Flight 1 Press Kit" (PDF). SpaceX. Retrieved March 1, 2017. ^ "SpaceX". NASA. Retrieved March 1, 2017. ^ Denise Chow (April 18, 2011). "Private Spaceship Builders Split Nearly $270 Million in NASA Funds". Space.com. Archived from the original on December 18, 2011. Retrieved March 1, 2017. ^ a b Koenigsmann, Hans (January 17, 2018). "STATEMENT OF DR. HANS KOENIGSMANN VICE PRESIDENT, BUILD AND FLIGHT RELIABILITY SPACE EXPLORATION TECHNOLOGIES CORP. (SPACEX)" (PDF). ^ "SpaceX delays commercial crew test flights to latter half of 2018 - SpaceNews.com". SpaceNews.com. January 11, 2018. Retrieved March 29, 2018. ^ "NASA's Commercial Crew Program Target Test Flight Dates". August 2, 2018. Retrieved August 3, 2018. ^ a b Mike Wall (September 10, 2015). "'Red Dragon' Mars Sample-Return Mission Could Launch by 2022". Space.com. Retrieved March 1, 2017. ^ Ralph, Eric (July 19, 2017). "SpaceX skipping Red Dragon for "vastly bigger ships" on Mars, Musk confirms". Teslarati. Retrieved July 29, 2017. ^ Bhargav, Sushant (September 9, 2017). "Elon Musk Shares the Look of Full-body SpaceX's Spacesuit". TechScoop.in. Archived from the original on February 7, 2018. ^ Martin, Sean (August 24, 2017). "REVEALED: The space suit humans on SpaceX rockets will wear to get to MARS". Express.co.uk. Retrieved September 14, 2017. ^ Timothy Prickett Morgan (March 27, 2015). "Rockets Shake and Rattle, so SpaceX Rolls Homegrown CFD". The Next Platform. Retrieved April 6, 2015. ^ Adam Lichtl and Stephen Jones (March 29, 2015). SpaceX Merlin (&Raptor) Engine R&D, GPU-Powered. SpaceX. Retrieved March 19, 2017. ^ Rand Simberg (February 8, 2012). "Elon Musk on SpaceX's Reusable Rocket Plans". Popular Mechanics. Retrieved March 1, 2017. ^ Jacob Aron (January 17, 2015). "SpaceX rocket crashes in first attempted boat landing". New Scientist. Retrieved March 1, 2017. ^ Elon Musk (December 21, 2015). "Background on tonight's launch". SpaceX. Retrieved March 1, 2017. ^ SpaceX (April 8, 2016). CRS-8 | First Stage Landing on Droneship. YouTube. Retrieved March 1, 2017. ^ SpaceX (April 8, 2016). CRS-8 Dragon Hosted Webcast – landing clip. YouTube. Event occurs at 26:58. Retrieved March 1, 2017. ^ Peter B. de Selding (October 5, 2016). "SpaceX's Shotwell on Falcon 9 inquiry, discounts for reused rockets and Silicon Valley's test-and-fail ethos". SpaceNews. Retrieved March 1, 2017. ^ "SpaceX launches first recycled rocket in test of cost-cutting model". The Globe and Mail. Archived from the original on March 31, 2017. Retrieved March 31, 2017. ^ "SpaceX successfully launches, lands a recycled rocket". NBC News. Retrieved March 31, 2017. ^ "Elon Musk's Mars dream hinges on a giant new rocket". Engadget. Retrieved March 29, 2018. ^ "SpaceX signs first private passenger to fly around the moon". Reuters. Retrieved September 14, 2018. ^ "SpaceX reveals mystery moon passenger, and he's a billionaire". CNET. Retrieved September 18, 2018. ^ "SpaceX Upcoming Missions". Spacexnow.com. Retrieved October 13, 2018. ^ Daniel Terdiman (March 9, 2013). "Elon Musk at SXSW: 'I'd like to die on Mars, just not on impact'". CNET. Retrieved March 1, 2017. ^ Alex Hern (June 2, 2016). "Elon Musk: 'Chances are we're all living in a simulation'". The Guardian. Retrieved March 1, 2017. ^ Sarah Fecht (June 2, 2016). "Elon Musk Wants To Put Humans On Mars By 2025". Popular Science. Retrieved March 1, 2017. ^ "Here's Why Investor Steve Jurvetson Saved Elon Musk's Space Dreams". Business Insider. Retrieved March 2, 2018. ^ Cecilia Kang, Christian Davenport (June 9, 2015). "SpaceX founder files with government to provide Internet service from space". The Washington Post. Retrieved March 1, 2017. ^ Jeff Stone (June 10, 2015). "Elon Musk's SpaceX Plans To Launch 4,000 Satellites, Broadcasting Internet To Entire World". International Business Times. Retrieved March 1, 2017. ^ Peter B. de Selding (January 19, 2015). "SpaceX To Build 4,425 Broadband Satellites in Seattle". SpaceNews. Retrieved March 1, 2017. ^ Caleb Henry (March 2, 2017). "FCC gets five new applications for non-geostationary satellite constellations". Space News. Retrieved March 1, 2017. ^ Alan Boyle (June 15, 2015). "Elon Musk's SpaceX Plans Hyperloop Pod Races at California HQ in 2016". NBC. Retrieved March 1, 2017. ^ Muoio, Danielle (January 27, 2017). "Elon Musk's Hyperloop contest is happening this weekend — here's a look at all the competing pods". Business Insider. Retrieved January 28, 2017. ^ Boyle, Alan (August 27, 2017). "Germany's WARR team wins SpaceX's Hyperloop II race with 201-mph pod run". GeekWire. US. Retrieved September 26, 2017. ^ "SpaceX Hyperloop website". SpaceX. September 10, 2017. Archived from the original on September 10, 2017. Retrieved September 11, 2017. ^ a b Michael Belfiore (January 20, 2012). "Inside SpaceX: We Visit the Company's California Headquarters – Slide 3". Popular Mechanics. Retrieved March 1, 2017. ^ Berger, Eric (March 19, 2018). "SpaceX indicates it will manufacture the BFR rocket in Los Angeles". arsTechnica. Retrieved March 21, 2018. ^ Masunaga, Samantha. "SpaceX may have big manufacturing plans for the Port of Los Angeles". latimes.com. Retrieved February 2, 2019. ^ Gwynne Shotwell (June 4, 2014). Discussion with Gwynne Shotwell, President and COO, SpaceX. Atlantic Council. Event occurs at 37:50–38:58. Retrieved March 1, 2017. We are vertically integrated. ... Metal—in sheet format, in wire format, and in block format—comes into our Hawthorne facility and rocket stages roll out. ... eliminating the exponential G&A and fee additions [that are experienced when you have] multiple layers of integration. ... For every dollar that comes in we spend [about] 63 cents of each dollar of revenue on subcontractors and suppliers, [but at] a lower-level of integration (wires, connectors, raw materials). ^ Speck, Emilee (June 28, 2017). "Port Authority approves SpaceX hangar for rocket storage". ClickOrlando.com. Retrieved May 11, 2018. ^ a b Ralph, Eric (December 24, 2018). "SpaceX CEO Elon Musk: Starship prototype to have 3 Raptors and "mirror finish"". Teslarati. Retrieved December 24, 2018. ^ a b Foust, Jeff (December 24, 2018). "Musk teases new details about redesigned next-generation launch system". SpaceNews. Retrieved January 13, 2019. ^ Murphy, Mike (January 10, 2019). "Elon Musk shows off SpaceX's massive Starship test rocket". MarketWatch. Retrieved January 12, 2019. ^ Mosher, Dave (January 23, 2019). "SpaceX's giant rocket ship was blown over and damaged by powerful winds in Texas — and Elon Musk says repairs will take weeks". Business Insider. Retrieved January 23, 2019. ^ Jason Paur (October 10, 2012). "Inside SpaceX's Texas Rocket-Testing Facility". Wired. Retrieved March 1, 2017. ^ Irene Klotz (August 2, 2013). "SpaceX Appetite for U.S. Launch Sites Grows". Space News. Retrieved March 1, 2017. ^ "Falcon 9 Launch Vehicle - PAYLOAD USER'S GUIDE" (PDF). SpaceX. October 21, 2015. Archived from the original (PDF) on November 15, 2018. ^ Chris Bergin (April 5, 2011). "SpaceX: Falcon Heavy, Falcon 9 tag team set to share 20 launches a year". NASASpaceFlight. Retrieved March 1, 2017. ^ "SpaceX Falcon 9 launches with SAOCOM 1A and nails first West Coast landing – NASASpaceFlight.com". Retrieved February 11, 2019. ^ Granath, Bob (March 24, 2015). "NASA, SpaceX Sign Property Agreement for Historic Launch Pad". NASA. Retrieved March 29, 2018. ^ Tribou, Richard (April 18, 2019). "Battered SpaceX Falcon Heavy booster knocked over at sea returns to Port Canaveral". Orlando Sentinel. Retrieved April 18, 2019. ^ "NASA, Partners Update Commercial Crew Launch Dates – Commercial Crew Program". blogs.nasa.gov. Retrieved February 11, 2019. ^ Eric Berger (August 4, 2014). "Texas, SpaceX announce spaceport deal near Brownsville". MySanAntonio.com. Retrieved March 1, 2017. ^ a b Laura B. Martinez (April 15, 2013). "FAA shares SpaceX EIS report". The Brownsville Herald. Retrieved March 1, 2017. ^ Leonard David (July 15, 2014). "SpaceX receives FAA approval for proposed spaceport in Texas". CBS News. Retrieved March 1, 2017. ^ Jeff Foust (September 22, 2014). "SpaceX Breaks Ground on Texas Spaceport". Space News. Retrieved March 1, 2017. ^ Jeff Foust (April 1, 2013). "The great state space race". The Space Review. Retrieved March 1, 2017. ^ Emma Perez-Treviño (June 24, 2014). "Mars theme returns in SpaceX land purchases". Valley Morning Star. Retrieved March 1, 2017. ^ Emma Perez-Treviño (October 23, 2014). "SpaceX land holdings grow". Valley Morning Star. Retrieved March 1, 2017. ^ "SpaceX adds a big new lab to its satellite development operation in Seattle area". GeekWire. January 27, 2017. Retrieved October 11, 2018. ^ Gene (July 8, 2016). "SpaceX expands to new 8,000 sqft office space in Orange County, CA". Teslarati. Retrieved March 1, 2017. ^ Dennis Stone, "NASA's Approach to Commercial cargo and Crew Transportation, Acta Astronautica 63, No. 1-4 (2008):192-97." ^ "SpaceX wins NASA COTS contract to demonstrate cargo delivery to Space Station with option for crew transport" (Press release). SpaceX. August 18, 2006. Retrieved March 1, 2017. ^ "Mission Status Center". SpaceFlightNow. Retrieved March 1, 2017. ^ Kenneth Chang (May 22, 2012). "Big Day for a Space Entrepreneur Promising More". The New York Times. Retrieved March 1, 2017. ^ "NASA selects SpaceX's Falcon 9 booster and Dragon spacecraft for cargo resupply services to the International Space Station" (Press release). SpaceX. December 23, 2008. Retrieved March 1, 2017. ^ "NASA Celebrates Dragon's Return". NASA. Retrieved March 1, 2017. ^ Chris Bergin (March 3, 2015). "NASA lines up four additional CRS missions for Dragon and Cygnus". NASASpaceFlight. Retrieved March 1, 2017. ^ Jason Rhian (September 27, 2014). "NASA continues Commercial "push" with CRS extension". Spaceflight Insider. Retrieved March 1, 2017. ^ Peter B. de Selding (February 24, 2016). "SpaceX wins 5 new space station cargo missions in NASA contract estimated at $700 million". SpaceNews. Retrieved March 1, 2017. ^ "Private Space Taxi's Crew Escape System Passes Big Hurdle". Space.com. October 28, 2011. Retrieved March 1, 2017. ^ "SpaceX Proposal for Commercial Crew Development Round 2" (PDF). NASA. 2011. Archived from the original (PDF) on June 12, 2012. Retrieved March 19, 2012. ^ Frank, Jr. Morring (April 25, 2011). "Five Vehicles Vie For Future Of U.S. Human Spaceflight". Aviation Week. Retrieved March 1, 2017. ^ "NASA Announces Next Steps in Effort to Launch Americans from U.S. Soil". NASA. August 3, 2012. Archived from the original on March 19, 2017. Retrieved March 1, 2017. ^ Zach Rosenberg (March 2, 2012). "SpaceX finishes crucial dress rehearsal before space station launch". FlightGlobal. Retrieved March 1, 2017. ^ "NASA Chooses American Companies to Transport U.S. Astronauts to International Space Station". NASA. September 16, 2014. Retrieved March 1, 2017. ^ "NASA awards SpaceX with crew missions to International Space Station". www.teslarati.com. Retrieved March 29, 2018. ^ a b "NASA Awards Launch Services Contract to SpaceX" (Press release). NASA. April 22, 2008. Retrieved March 1, 2017. ^ "Air Force's Space and Missile Systems Center Certifies SpaceX for National Security Space Missions". USAF. May 26, 2015. Retrieved March 1, 2017. ^ "U.S. Air Force certifies SpaceX for national security launches". May 26, 2015. Retrieved February 2, 2019 – via www.reuters.com. ^ "SpaceX undercut ULA rocket launch pricing by 40 percent: U.S. Air Force". Reuters. April 28, 2016. Retrieved March 1, 2017. ^ Calendrelli E, Escher A (December 16, 2016). "The top 15 events that happened in space in 2016". TechCrunch. Retrieved March 1, 2017. ^ Mike Gruss (April 27, 2016). "SpaceX wins $82 million contract for 2018 Falcon 9 launch of GPS 3 satellite". Space News. Retrieved March 1, 2017. ^ a b "Air Force Certifies SpaceX for Missions, Ends Launch Monopoly". Fox News. May 27, 2015. Retrieved March 1, 2017. ^ Christian Davenport (May 26, 2015). "Air Force certifies Elon Musk's SpaceX to launch national security missions". Washington Post. Retrieved March 1, 2017. ^ "ULA Punts on GPS 3 Launch Contract Long Sought by SpaceX". SpaceNews.com. November 16, 2015. Retrieved February 2, 2019. ^ Gruss, Mike (February 4, 2016). "Pentagon disputes ULA claim on why it didn't bid for GPS 3 launch". SpaceNews.com. ^ "SpaceX prepares for its first big NRO launch". SpaceNews.com. April 26, 2017. Retrieved February 2, 2019. ^ "SpaceX's low cost won GPS 3 launch, Air Force says". SpaceNews.com. March 15, 2017. Retrieved February 2, 2019. ^ "ULA, SpaceX secure nearly $650 million in Air Force launch contracts". Florida Today. Retrieved March 29, 2018. ^ Erwin, Sandra (February 19, 2019). "Air Force awards $739 million in launch contracts to ULA and SpaceX". Space News. Retrieved February 19, 2019. ^ "Transporting two Kazakh satellites aboard Falcon 9 will cost $1.3 million". astanatimes.com. ^ Kazakhstan chooses SpaceX over a Russian rocket for satellite launch. Eric Berger, Ars Technica. 6 November 2018. ^ Jonathan Amos (December 3, 2013). "SpaceX launches SES commercial TV satellite for Asia". BBC News. Retrieved March 1, 2017. ^ Michael Belfiore (December 9, 2013). "The Rocketeer". Foreign Policy. Retrieved March 1, 2017. ^ Doug Messier (January 14, 2014). "Shotwell: Reusable Falcon 9 Would Cost $5 to $7 Million Per Launch". Parabolic Arc. Retrieved March 1, 2017. ^ a b Peter B. de Selding (January 12, 2015). "Arianespace, SpaceX Battled to a Draw for 2014 Launch Contracts". SpaceNews. Retrieved March 1, 2017. ^ Peter B. de Selding (April 14, 2014). "Europe's Satellite Operators Urge Swift Development of Ariane 6". SpaceNews. Retrieved March 1, 2017. ^ Amy Svitak (February 11, 2014). "Arianespace To ESA: We Need Help". Aviation Week. Retrieved March 1, 2017. ^ Peter B. de Selding (April 14, 2014). "Satellite Operators Press ESA for Reduction in Ariane Launch Costs". SpaceNews. Retrieved March 1, 2017. ^ David Ramli (May 19, 2015). "NBN launcher Arianespace to cut jobs and costs to fight SpaceX". The Sydney Morning Herald BusinessDay. Retrieved March 1, 2017. ^ François Némo (June 3, 2015). "Airbus dans la Silicon Valley : une occasion manquée pour l'Europe" (in French). lesechos.fr. Retrieved March 1, 2017. ^ Melody Petersen (November 25, 2014). "SpaceX may upset firm's monopoly in launching Air Force satellites". Los Angeles Times. Retrieved March 1, 2017. ^ "Air Force budget reveals how much SpaceX undercuts launch prices". Ars Technica. Retrieved March 29, 2018. ^ spacexcmsadmin (November 27, 2012). "Capabilities & Services". SpaceX. Retrieved March 29, 2018. ^ Andrea Shalal (May 21, 2015). "Lockheed-Boeing rocket venture needs commercial orders to survive". Yahoo. Retrieved March 1, 2017. ^ Greg Avery (December 14, 2014). "ULA plans new rocket, restructuring to cut launch costs in half". Denver Business Journal. Retrieved March 1, 2017. ^ Melody Petersen (October 16, 2014). "Congress OKs bill banning purchases of Russian-made rocket engines". LA Times. Retrieved March 1, 2017. ^ "As the SpaceX steamroller surges, European rocket industry vows to resist". July 20, 2018. Retrieved July 21, 2018. ^ Wattles, Jackie (January 11, 2019). "SpaceX to lay off 10% of its workers". CNN. This page is based on the Wikipedia article SpaceX; it is used under the Creative Commons Attribution-ShareAlike 3.0 Unported License (CC-BY-SA). You may redistribute it, verbatim or modified, providing that you comply with the terms of the CC-BY-SA.